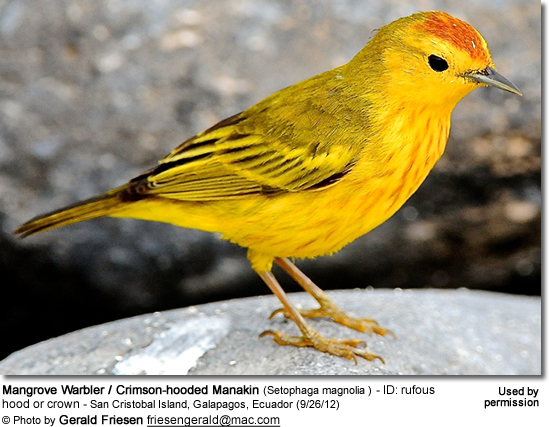 The Yellow Warblers, Setophaga petechia, occur naturally across most of North America and range south to northern South America. Different races have been identified. Range: Resident. Found in the mangrove swamps of coastal Middle America and northern South America. ID: Reddish-brown hood or crown on breeding males. Larger size. Range: Migratory. Breed in temperate North America as far south as Central Mexico; and migrate south to Central and South America for the winter. Vagrants have been reported in Western Europe. Range: Mostly resident. Found in the mangrove swamps of the West Indies. Breeding colonies of the Cuban Golden Warbler have now established themselves in the Florida Keys. Plumage: Upper parts are greenish-yellow and yellow below. Brighter in breeding males. Some subspecies have reddish crowns. 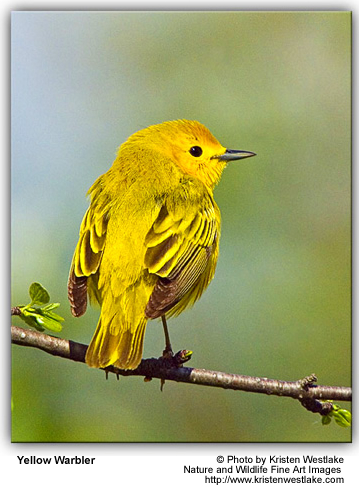 Yellow Warblers nest in trees. Their cup nests are made out of twigs and grasses. The average clutch consists of 3 to 6 eggs. Those occurring in the tropics typically lay fewer eggs. They primarily feed on insects and spiders, but northern races will also take some berries. Calls: soft or harder ship.